The final turn at Gravesend. Photographed and published by B.W. Kilburn, c1909. Library of Congress. The Gravesend, Sheepshead Bay, Brighton Beach, Coney Island, and Prospect Park courses were all located in my fair borough. The Gravesend track was in the southernmost part of Brooklyn, north of Coney Island and northeast of what is now Bath Beach. It was under the supervision of the Brooklyn Jockey Club, headed by the brothers Dwyer, Phil and Mike. The track hosted the Preakness while that race was in exile from its home state of Maryland, from 1894 – 1908; the Gazelle and the Tremont were first run at Gravesend. But perhaps the course’s two biggest races paid homage to its home borough: the Brooklyn Derby (now the Dwyer), and the Brooklyn Handicap. Dry Monopole ran the greatest race of his life, and in so doing not only won the rich Brooklyn Handicap, but lowered the record for one mile and a quarter to 2:07. …Dry Monopole’s record is far and away better than anything that has ever been done at the distance. He is a great horse, and has by yesterday’s performance not only landed a rich stakes, $6,650, in his owners’ pockets, but made Mr. Emery and his partners in the ownership of the colt some $50,000 richer in cash acquired from bets made early in the season. Four years later, when one of the most celebrated horses in the country, Tenny, was pointed to the Brooklyn, anticipation appears to have rivaled that of a Triple Crown race; for weeks ahead of time, the New York Times carried stories and updates on the possible entrants for 1891 running. The race took place on May 15th; on April 27th, the Times assessed the possible starters, lamenting that some “trifling lameness” from which Tenny had recovered might prevent him from running in the Brooklyn at all, or from running his best race. …[the] race…will probably be the best ever run in America by all-aged horses. …the field will be by far the largest that has ever faced the starter for a Brooklyn Handicap, numbering, in all probability, twenty or more. Several hundred people showed up on Wednesday to see the trial, characterized as “…work…so even as a whole that it made trying to pick the winner a more difficult task.” Hyperbole aside, this article would look rather familiar to anyone who’s read Mike Welsch’s pre-Derby workout reports. There may have been at some time and place a better race than the Brooklyn Handicap of 1891. If there has been the present generation did not see it. Of course they would like to see a better, but it is doubtful if they ever will. The railroad service, as usual was abominable and utterly inadequate on all the lines, for the crowds were something greater than they had expected and prepared for. That was to be expected, however, for the owners of Long Island railroads are never prepared to take care of the great crowds that experience has taught them they will have to care for on big race days. A jacket of blue and white inclosing a black boy on a bay horse shot down the track as if propelled by a giant catapult. It was “zip” for a furlong, and in that furlong the horse with the tremendous burst of speed shook off all his competitors as if they were only horned cattle. 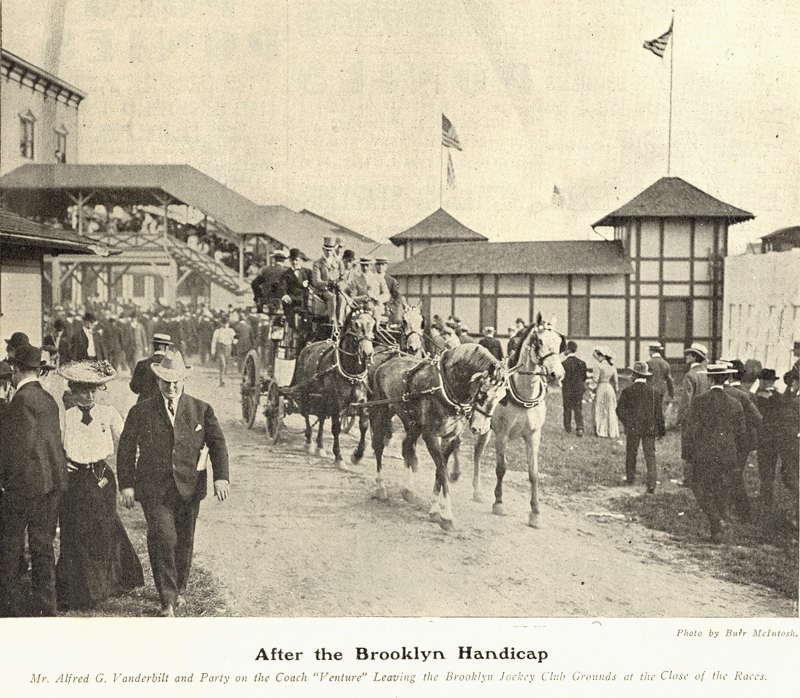 Today, 119 years after Tenny’s win and 123 after the Brooklyn was first run, eight horses will take to the track in the mile-and-a-half Brooklyn Handicap; less than half the number of horses will contest the race today than did in the 19th century. Though Belmont Park will be swarming with writers, they’re here to report on tomorrow’s Big Race; the Brooklyn no longer quite fits that description, and it likely won’t receive quite the coverage that it did over a hundred years ago. But as we anticipate tomorrow’s storied Belmont, some of us will take especial pleasure in today’s running of the Brooklyn…even if it’s being run on Long Island. “Dry Monopole’s Victory.” New York Times, May 15, 1887. “The Brooklyn Handicap: It Will Be the Greatest Race Ever Run in America.” New York Times, May 10, 1891. Fabulous, Teresa. I love it! !